As you enter the College Valley the rugged twins, Easter and Wester Tors, join forces with close neighbour Hare Law to dominate the view to the south east. The smaller of the twins, Easter, stands at a height of 438 metres whilst its sibbling is some 80 metres taller. The isolated Commonburn House nestles beneath the flanks of Newton Tors and lies at the centre of a `spaghetti junction` of footpaths and bridleways. The tiny settlement of Old Yeavering slumbers in the shadow of Yeavering Bell, one of the best known and historically most important of the Cheviot Hills, and marks the starting point of this walk. It is a journey of outstanding views and fine moorland walking. So, start your engine, engage the gears and head for the open `road`. 1. The tiny settlement of Old Yeavering consists of two mid-19th century cottages and an old farm outbuilding and lies just off the B635, along a short, rough gravel track, some 5 miles from Wooler. A village was recorded at this site as long ago as 1296 but all traces of this ancient settlement have long since disappeared. There is limited parking (NT 924303) along the narrow grass verge on the left hand side of the gravel track. Please park with great consideration, close up and personal with the boundary hedge. Revved up and ready to go, now head towards the cottages, pass through a solid metal gate where the adjacent signpost points the way to `Hethpool 2½ & Commonburn House 2¾`, bend right with the track and cross over the trickle of a thin burn. The long rectangular farm outbuilding, to your left, was once a tower and was marked on a map of the area as early as 1584. 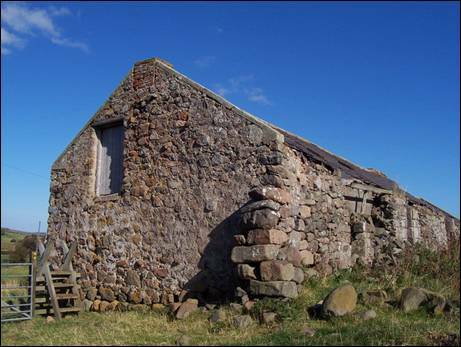 In his 1950 booklet, `A Guide to the Cheviot Hills`, F. R. Banks wrote “this barn is known locally as King Edwin`s Palace” although he added, “it cannot be part of the royal country seat of that monarch, being of later date”. It is now in need of some serious `tender, loving care`. Continue with the gravel track as it climbs steadily uphill with the gorse covered banks falling away to your left. The slopes of Yeavering Bell rise steeply up from the opposite bank of the burn. Eventually, after just over ¾ mile of walking and immediately after a large rock and a cattle grid, a directional fingerpost (NT 916292) indicates that it is time to leave this track, to your left and to start the next stage of your uphill journey along a good, green track with a stone base. 2. You are now following, for just short of ¾ mile, the route of St. Cuthbert`s Way as it makes its way through the Cheviot Hills towards its ultimate destination of Lindisfarne. Keep with the green track as it rises sharply up the northern side of Newton Tors. It will be some while before you reach the summit triangulation pillar! A ladder stile takes you across a stone wall, where there are fine views, and, once on the other side, continue with the green track, now on an easing gradient. 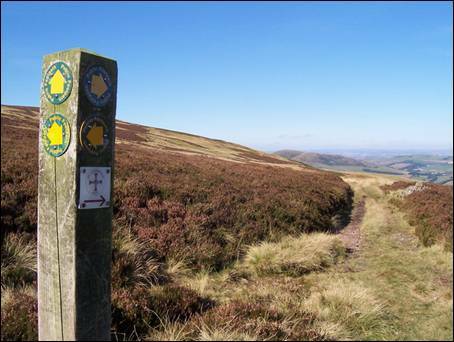 Soon you will reach a shin high directional marker (NT 923287) and the moment to bid `adieu` to St. Cuthbert`s Way. You will meet up again later in the day. Turn right, climb over the ladder stile and walk straight on, following a thin path which heads towards, but not through, a five bar gate. The path contours the lower hillside before eventually turning left to begin the climb towards flatter and higher ground. There is an occasional marker post along the way. As you rise uphill, pause once or twice to admire the good views towards the College Valley and the tiny settlement of Hethpool. Once flatter ground is reached, you will need to follow the path which bends to your right and heads the short distance to the unmistakable rocky Easter Tor (NT 915281). Once again, a shin high directional marker points the way. If you are lucky, you may just catch sight of the shy feral goats which have roamed this part of north Northumberland for centuries. On the other hand, if you are unlucky, you may catch a whiff of these animals with extreme `personal hygiene` issues. The 438 metre high Easter Tor is separated from its taller twin by what F. R. Banks described as “a precipitous dene” at the bottom of which stand the scant remains of the late 18th century farm of Harrowbog, which consisted of four buildings around a central courtyard. 3. Leave Easter Tor by a clear path which heads generally south to join, after a short time, the main track which you must follow by turning right. This is shown on the Ordnance Survey map as a `permissive path` and crosses hillside which is now `access land`. The track soon begins to climb uphill and, in the process, turns gently towards the north. On reaching level ground (NT 907267) and yet another shin high directional marker, with the rocky top of Hare Law prominent to your left, it is time to strike out to your right, heading in a north westerly direction. Rising ever so slightly across heather covered ground you will almost immediately catch sight of the triangulation pillar, standing at a height of 537 metres, marking the top of Newton Tors (NT 908269). As you go, keep your eyes peeled for the occasional peat pool. The pillar was one of 6,557 such pillars in the old triangulation network, constructed between 1935 and 1962, of which 314 were `primary` pillars. The remaining 6,243 were `secondary` pillars and `filled the gaps` between the `primary` ones, the nearest of which stands on the summit of The Cheviot, some 6.4 km. away. Nearby `secondary` pillars can be found on Gains Law, Cold Law, The Curr and Staerough Hill. The vast majority of these triangulation pillars have now fallen into disuse and whilst the Ordnance Survey retain a database of their locations they have no interest in the current state of repair of individual pillars. A number of groups throughout the country have "adopted" individual pillars and keep them in good repair. After admiring the view, head in a north westerly direction, initially over the heather clad summit, to join the track which will lead you, by turning to your right, to the obvious Wester Tor (NT 907272). From this rocky promontory there are splendid views across the College Valley to the green, rolling border hills. 4. Time to rewind and to head back along the track you have just walked, keeping with it as far as the shin high directional marker where you earlier turned to claim the summit of Newton Tors. Turn right, cross over the step stile and follow the fence hugging path and the dilapidated dry stone wall towards the cairn topped height of Hare Law. On reaching the corner of the dry stone wall and an adjacent directional fingerpost, walk to your right for some 100 metres. 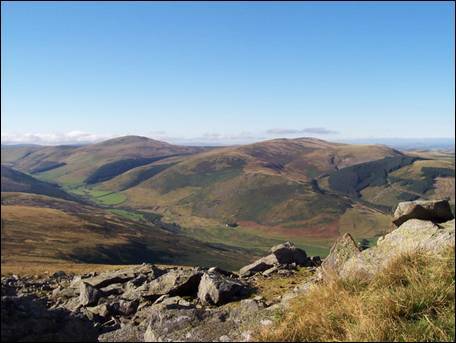 This 518 metre high, boulder strewn summit (NT 902265) offers outstanding views towards the head of the College Valley and to The Cheviot. The deep cleft of the Bizzle `scars` the northern flanks of Northumberland`s mightiest hill whilst Braydon Crag raises a defiant fist skywards. On the 4th June 1986, a glider from the Border Flying Club at Milfield crashed into the top of Hare Law killing the 45 year old pilot. Head back to the corner of the dry stone wall and, keeping straight on, head downhill with the wall and then a post and wire fence to your left. Now begins a 2½ mile journey across predominantly heather moor to your next objective, Preston Hill. Keeping the post and wire `guide` on your right and, with the distant Coldburn Hill in front of you, keep straight on. Whilst this can seem to be a slightly tedious slog over the potentially boggy watershed of the Common Burn, the surrounding hills to the west and south are a constant distraction. Keep your pecker up and on reaching a step stile and a shin high directional marker, cross over the fence and continue your journey, now with the fence on your right. Before long you will reach the small plantation (NT 910244) running down the slopes of Preston Hill. Turn left and, keeping alongside the fence, climb towards the 526 metre high summit, passing along the way a large Bronze Age cairn. 5. Continue across the top of the hill and then descend steeply down a thin rocky path. This col (NT 928235) separates Preston Hill from its neighbour, Broadhope Hill and marks the watershed of the Broadstruther Burn, which begins its journey by flowing north eastwards. This is your direction of travel so, turning to your left, follow the fence for just over ½ mile. At this point the path cuts diagonally to the right, climbing ever so slightly to cut cross the lower slopes of Broadhope Hill and, in the process, turns gradually to the east. You are heading for the former shepherd`s house of Broadstruther, recently renovated to provide shelter for shooting parties, and whilst the occasional directional fingerpost points the way, be careful not to be tempted by any side paths. Eventually you will pass through a strand of mature trees and, keeping to the left of the building (NT 941248), you will almost immediately join a gravel track. A plethora of public footpaths and bridleways radiate from Broadstruther, but your onward route is straight forward. Turn left along the gravel track and stay with this until it turns to the south east, close to where it is joined by the Hazelly Burn. Leave the gravel track to your left and, dropping downhill slightly, watch out for the wooden footbridge across the Broadstruther Burn. Once on the other side, ascend a short slope and cross over the step stile. 6. Here the path splits in two, alongside a directional fingerpost (NT 946253), with the right hand fork heading towards the Carey Burn. You must follow the left hand path, climbing uphill in a north westerly direction along a splendid green track. Stay with this as it crosses almost a mile of mixed grass and heather moor towards the remote dwelling of Commonburn House, with the unnamed, but impressive crags, to your right. The occasional directional fingerpost will keep you walking in the right direction as the track begins to diminish to a footpath. As you get closer to the buildings you must cross the Common Burn via a shallow ford and head towards the right hand side of the beautifully located and well maintained house. Beyond the house, after passing through a five bar gate, turn right along a gravel track and, after crossing a cattle grid, turn left (NT 930268) to follow a track heading uphill. An easy walk of just less then 1 mile, with Newton Tors now rising away to your left and the distinctive Yeavering Bell straight ahead, leads you in a northerly direction. Along the way, be sure to take the left hand fork, when the track splits in two, and, further on, to continue straight ahead after climbing over a ladder stile. Soon, you will reach the junction (NT 928281) with St. Cuthbert`s Way, the 62½ mile long footpath linking together the religious sites of Melrose Abbey and Lindisfarne. Turn left, passing a cairn on your right. 7. There are fine views ahead and all too soon you will, once again, reach the shin high directional marker (NT 923287) you passed all those hours ago. This time around you must turn to your right, signed `Yeavering Bell ½ Gleadscleugh 2`and head downhill along a clear path, crossing a thread thin burn before heading uphill on a directional fingerposted path. As you climb, you will pass a circular sheep stell before finally reaching the col (NT 928293) between the two tops of the outstanding Yeavering Bell. 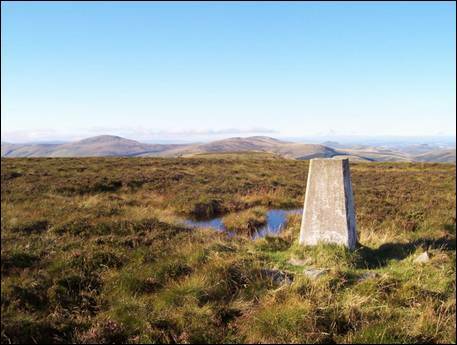 The highest point, at a modest 361 metres, lies to your right and is crowned with a walkers cairn, whilst to your left lies the lower, by a mere 6 metres, of the two tops. You must visit both. This is the site of Northumberland`s most spectacular hillfort with a DNA stretching back over 2,500 years. Be sure to explore the stone ramparts which protected some 130 roundhouses and, although primarily an Iron Age site, the discovery of Roman pottery and coins reveals a very long period of occupation. This site is a Scheduled Monument protected by law. Head back to the col and, heading north westerly, cut through the stone ramparts, where a directional fingerpost stands on the other side, and then follow the path which cuts steeply downhill, initially in a generally westerly direction. Now it is a simple matter of following the `Hillfort Trail` directional fingerposts and the path will ultimately deliver you back to the farm outbuilding and onto the gravel track leading to Old Yeavering. As you turn your head and look back at the steep, stone scattered slopes of `The Hill of the Goats` you might just find the energy to reflect on what life might have been like in the year 700BC.